Registration for the Spartans 2019 Summer Season is active! Please note the following eligibility rules: Incoming 7th-12th graders only. Players must be a 2006 birth year or OLDER to be eligible. Fee: $325 - includes evaluations/meet the coaches skate on April 24 (8:30-9:30pm @ Valley Ranch), 10 games +plus playoffs (if qualified), and home/away practice jerseys, if needed. We will not hold practices over the summer season. Please use the registration button below to sign-up for the summer season by April 23. No payment is required at this time. 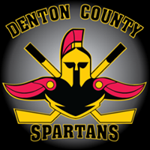 Fee to be paid at the meet the coaches skate, make checks payable to "Denton County Spartans." Please bring both a black and white jersey to the meet the coaches skate.